I love a good mystery. To be honest I even love a bad mystery. I have seen every episode of Scooby Doo and Murder She Wrote, even the cross over episodes with Magnum P.I. (forgot about those didn’t you). I can’t take too much blood or gore but I do love to know “who dun it”. That’s why I was absolutely head over heels to discover two of my favorite British murder mystery series at the Library. 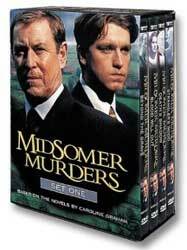 The first in my heart is “Midsomer Murders”. Detective Chief Inspector Barnaby and his partner (either Scott or Troy) dig into the heart of small towns in Midsomer County England solving murders and disturbing long held secrets along the way. Between solving murders, keeping his young protégée in check and dodging his wife’s lousy cooking Barnaby deals patiently with it all and never fails to get his man (or woman). The small towns have all the interesting characters we have come to expect and the supporting cast is enjoyable as well. It all comes together to make a very pleasant hour and a half of murder mystery British style. 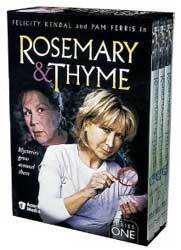 The second series is “Rosemary and Thyme”. Two women Rosemary Boxer and Laura Thyme have come to a cross roads in their respective lives. They decide to throw in together and become gardeners (one actually is more or less so that helps). Whether they are asked to revive dead gardens or plant new ones they always seem to run into a dead body or two. After nine seasons of “Murder She Wrote” this no longer seems strange to me. Sadly there were only three seasons of this show but the Library has them all! Check out more mysteries at your neighborhood library. This entry was posted in Recommendations, Uncategorized and tagged british, Midsomer Murders, murder, mystery, recommendations, Rosemary & Thyme by ccld. Bookmark the permalink. ← Previous Previous post: Which is better…the book or the movie?